How does one say goodbye to a coworker who’s moving on, presumably to bigger and brighter opportunities? Perhaps a round of farewell drinks at happy hour? A speech and some cake in the office break room? A coworker of mine – Matt – is leaving. I organized his farewell happy hour. I titled it "Matt's a Loser." 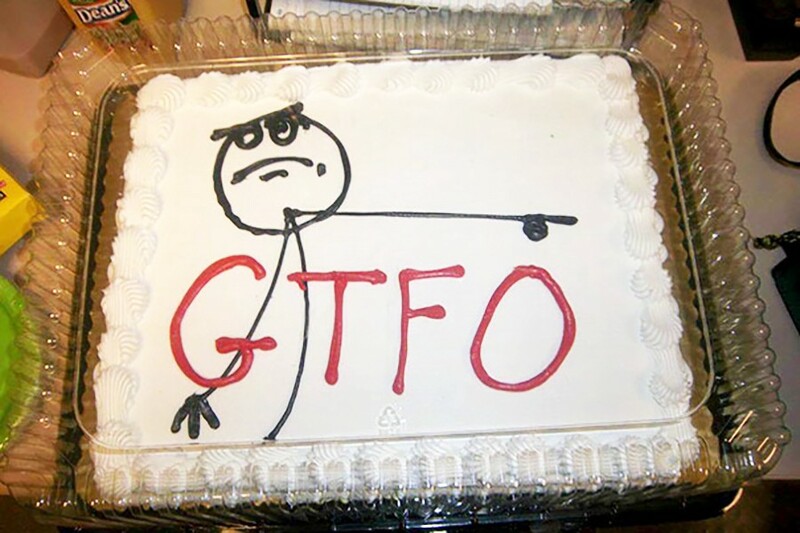 The trend of farewell cakes bearing nasty messages for soon-to-be-former colleagues is on the upswing, thanks in part to their potential as magnets for social media points. (If you can’t post something irreverent from a party, it couldn’t have been that fun.) As with viral handwritten notes, the cakes appear to be solid evidence of meaningful effort and emotion, which in this case manifests as a token of cheeky affection. We care so much about this coworker that we wanted to celebrate the next step in their career path… by feeding ourselves a dessert that also happens to roast them for leaving us behind. But while you’re free to request any one-liner the bakery is willing to write on their product, some cake burns have proved more popular than others. By far the most common is the “you’re dead to us” variety, which often includes the clarification “we hope you fail.” In fact, you have to wonder if the sentiment isn’t a tiny bit genuine. In the near-literal reading, “you’re dead to us” tells us something about the nature of work itself (as opposed to the relationship between professional colleagues). It says that one’s job and one’s life are essentially synonymous — that anyone passing beyond an employer’s veil and handing in their building ID card is irretrievably lost. We are unlikely to keep in touch on Facebook, let alone see them socially. They will become a minor, forgettable ensemble player of a fleeting scene in the story you tell about yourself. The departure of a coworker reveals how thin your acquaintance was, how shallow the connection. Nobody is happy in the knowledge that employment consumes identity along with time, or that our attachments within it tend to remain artificial. Yet the send-offs for Cheryl in accounting and Brian in HR are among the few opportunities we have to express this dissatisfaction — it’s like a group exit interview, with alcohol. And it’s perfectly normal to be jealous of the person who has “escaped” one 9-to-5 grind for another, since that next position’s headaches are inaccessible to those who didn’t get the gig, even as they fantasize about the hefty pay and perks involved. Someone else made a leap; you’re stuck. The resentment, of course, is hardly limited to a single unimportant employee, but broadly applied to what feels like a revolving-door career market in which constant lateral movement is a sign of survival and transience is the true constant. With the friction between an entrenched stereotype of job-hopping millennials and statistics that challenge the myth of their disloyalty, it’s easy to assume you’re stalling out by staying with the same company for a few years. The people we buy snarky cakes for haven’t been around for 40 years, and they’re not retiring altogether — they’re just passing through and blowing us off, so why pretend they were indispensable, or a genuine friend? The farewell cake is a compulsory gesture hijacked to convey this indifference. We don’t throw goodbye parties for people who get fired or laid off, as frequently as it happens, and despite the obvious: These castaway coworkers are in greater need of emotional and social support than anyone who just gave their two weeks’ notice. Too bad our bosses have branded them as pariahs unworthy of that courtesy — and it’s a mark of our grudging obedience that we concede the point. No, the last hurrahs are for winners, the lucky contestants who make it off the dysfunctional island that is a workplace, and we can’t let them go without a passive-aggressive tribute that pretends to deeper intimacy: After all, we might want to add them on LinkedIn later.